Crumbs, that week went fast! And we've just changed the clocks by an hour here in the UK overnight - you did, didn't you? That means darker evenings earlier of course, just in time for Halloween tomorrow. - the little elephants were great fun to play with as I used the 'mirror technique' for them. The stamp set I used is called 'Love You Tons' by Lawn Fawn and it does actually come with two slightly different little elephant stamps which face one another but I wanted to do a mirror image of just one - to prove it can be done really! - so, I stamped both elephants onto a snippet of white card facing one another, following Jennifer's video. I used Memento 'Tuxedo Black' ink and a stamp from the Paper Smooches 'Mirror Blocks' set, plus a little elephant from the 'Love You Tons' set. Found I had to work very fast. Jennifer recommends using VersaFine ink as it doesn't dry too quickly and I can see where she's coming from on that one! My card design bears more than a passing resemblance to one of Jennifer's cards on the blog post linked above - I really liked the idea of the red, white and turquoise blue together, with embossed hearts on the backing panel. Of course you can achieve good results using just a piece of acetate and no Misti - I've done this in the past, especially for 'reflections' in water or on snow when you want to 'flip' the image. But IMHO the Mirror Block stamps and the Misti do take a lot of the 'risk' away. You get the chance to stamp over the image again totally accurately if you aren't happy with the first 'press' and the Mirror Blocks are much less likely to 'smudge' as they're made of polymer just like clear stamps rather than slippery acetate. But there again, we always managed to cope doing it the old way didn't we? I often stop and wonder when the craft world will run out of ideas to tempt us into spending more money - not likely for a good while yet! 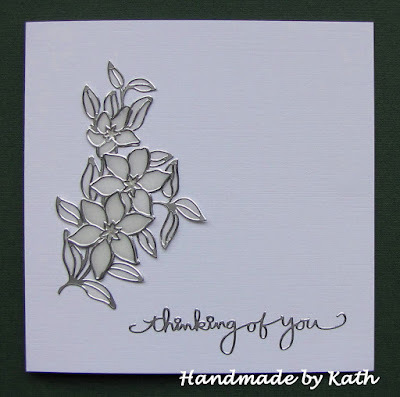 Kath shared this really elegant card with us. I love the way she used vellum with a gorgeous peel off - perfect use of a vellum snippet and also for Less Is More's challenge for last week which was to 'use vellum or acetate'. Just had to include this wonderful note pad, made by Alice. It sums up Autumn perfectly and really is something I'd love to try making at some point in the future. My understanding is that Alice used the outer cover of a hard back diary or similar as the starting point - so it's clever upcycling too! Lovely to see Bozena playing along with us again - and what an inspirational Christmas card too! Some wonderful 'colour smooshing' on the blue panel there as well. And, Sue and Roy tied the knot on 22nd October! After his illness and such a worrying time it was really heartwarming to see so much happiness on their special day. The official photos should be on Sue's blog before too long (I hope so Sue?) - meanwhile here's one to keep you going :) Such a pretty outfit as well! We had two new Playmates last week - and 57 of you came to play in total. As always, such wonderful inspiration from all of you! This is the sweetest bookmark, made by 'Paperpapier' - I think it's so pretty and very clever how it slips over the corner of the page. Helen hopped into the Playground to share this beautiful card - I love the 'camouflage' technique and this really is such a perfect example! Welcome to both of you and we hope you come back and play really soon! Well, that gave me goosebumps when Jenny's number popped straight out of the Random Number thingy! First of all, Jenny's card last week featured Scottie dogs and tartan as my own snippets card did - by pure coincidence. And, Jenny's nickname at school was 'Scottie' so she has a real affinity with Scottie dogs!! Well done Jenny, I'm sure everyone else will agree that this prize is just perfect for you. Sadly, no-one took up Penny's kind offer of tickets to the Crafting Live Show at Peterborough on 11th/12th November. But it was really kind of you to offer the tickets Pen! One set of Paper Smooches 'Mirror Blocks' stamps (the largest stamp is 2.5" x 3.5" by the way) and also a Lawn Fawn 'Love You Tons' dinky little set of stamps. Just like I used for my snippets card today. The Snippets Challenge will run for one week and the Playground gates will close at 11am UK time on Saturday 5th November. The gates will open again at midnight UK time on the same day. A maximum of ONE entry and please say in a comment if you wish to play and be a possible winner of the prize. Once again, I think both items work really well as a pair but if you have a burning desire for just the 'mirror blocks' stamps or the 'Love You Tons' stamps then please feel free to say and if your name pops out then I'll do a second draw for the item you don't want. Please also link back to the Playground in your blog post to be eligible for the draw. Parsnip (aka the little white peril) is in disgrace after doing a practice run with green eyeshadow ready for Halloween. But he sends a wave from the 'naughty corner' anyhow! Some tips about vellum. Do keep a little strip of vellum and try out your markers on the reverse before launching into colouring whatever you've stamped. It's really dramatic how muted the colours become once you flip the vellum over to the right side. When colouring the vellum on the reverse it helps to work with a dark piece of paper or card underneath so that the white outlines stand out - and keep a piece of white card or paper at hand as a background to check how the colours are working out. Also, my first attempt at attaching the flowers to the card from almost ended in disaster - Collall glue reacts quite violently with Pro markers on vellum and not only doesn't want to stick but will also lift the colour right off the vellum. Luckily I spotted it right away and switched to 'Glossy Accents' instead. Finally, on my card above, I'd trimmed parts of a couple of the flowers too close to the white embossed line. Only noticed this as I was finishing off writing this post and I haven't changed the photo - but, those white lines are now back in place along the edges where I'd trimmed too close. Courtesy of my Signo white pen - which did need a little scribble on a snippet of ordinary paper to get the ink flowing. My guess is that it's because vellum is such a silky surface. I'm sure I have 'wonky' eyes! Even using clear polymer stamps I struggle horrendously when trying to get decent images using the so popular 'multiple stamp' images such as SU flower sets. 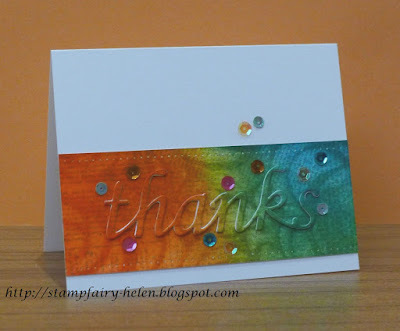 Wow, I love using the Misti for this type of stamping! 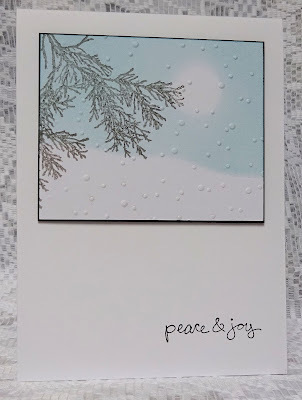 You can actually use just the Misti for this technique with clear stamps by carefully lining up the stamps onto the image, to be picked up by the lid as you build it up - and of course you can make several cards exactly the same at the same time, step by step. As I don't trust my alignment capabilities I used the method which is absolutely perfect for solid rubber stamps whereby you use either acetate or something like the plastic sheet from the Stamp-a-ma-jig along with the Misti. SU originally used to make their layered stamps from red rubber and boy did I struggle. Can't wait to dig a couple of old rubber layered sets out and have a play now! Step 1: First of all I used some masking tape to stick the SU plastic sheet from the Stamp-a-ma-jig to the top edge of the Misti with the lid open, butted right up against the top and side edges. Step 2: Then I placed the main 'body' stamp onto the plastic sheet face down and closed the Misti lid onto it so that the lid picked it up. Inked the stamp and stamped the image onto the plastic sheet. Step 5: Then replaced the main flower stamp on the plastic sheet with the middle layer stamp (it doesn't matter if you're not exactly in the same spot). Picked the stamp up with the lid as in Step 2, inked it with the middle colour and stamped it onto the plastic sheet. As the plastic sheet was held in place with masking tape as a hinge I could just move the flower image on the white card around underneath the plastic to find the right stamping position and hold it in place with a couple of magnets. Then re-inked the stamp, lifted the plastic sheet out of the way and stamped onto the white card again. I really wish I could find that video again! It certainly is a much simpler process than the above photos and words imply! It's time for Mo's Rudolph Days Challenge for October - it runs from today until the end of the month. And, there's only one more left after this one until the real countdown begins! Done! The camera does tell porkies though as in real life the cream colours on the topper and the card blank are identical. - 6" x 6" white card - to be honest it's a tad under that size as I check the 'supposedly matching' envelopes before making a card these days! - snippet of black card stock, die cut using the Tonic Studios 'Rococo Scotty Dog' die' - I carefully saved the cut out pieces from his eyebrow, legs and underneath the tummy and am so glad I did! Must search out some more tartan paper or card as this was such fun to make (once I worked out a few of the little tricks) and would be a lovely Christmas card for a few Scottish friends. I'd like to enter this card into the current Merry Monday Challenge #218 where the theme is 'Plaid' - or 'Tartan', as we British call it. 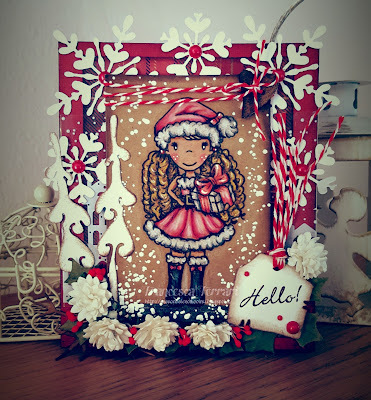 And also into Craftyhazelnut's Christmas Challenge #304 'Use a Sentiment' and well as Craftyhazelnut's Christmas Challenge Extra for October where it's always 'Anything Goes'. Hedgehog update - the little perishers are going berserk! We think there could be as many as NINE different ones coming to feed over the course of a night. Len was awake in the early hours of Wednesday morning and heard a regular clattering from one of the hedgie feeding stations. At 4am he dragged himself into the garden to investigate (bless) and there was one very irate hedgehog - impatiently flipping the lid up and down on an empty bowl! I sure hope they all decide to have a sleep this Winter as we're becoming victims of our own success with them! I think this is such a clever way to use up strips of snippets, by making them into book spines as Megan has! From Kim we have a 'twisted pocket' card - what a great design and I had no idea how it's done but did find a YouTube link which gives the general process very clearly. For anyone looking for a really elegant Christmas card design to do some 'batch baking', Viv's card above is a real beauty! I LOVE this card, made by Bonnie as part of her Merry Monday DT work - where the theme is 'plaid' right now (hence my Scotty dog card of course!). Such a super idea to make a 'package' and that Rudolph tag is just so cute:) I worked out that the antlers are made from a punched snowflake! A touch of Halloween next, made by Helen. I love the simplicity of this design - and it's fun as well! Err, unless you're have arachnophobia I guess! 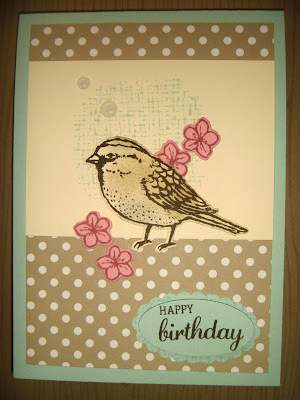 This is such a sweet card, made by April - using the SU 'Best Bird' stamp set, which is now on my wish list of course. Love how well the colouring of the bird goes with the polka dot paper. Totally adore this card, brought to share with us by Shaz in Oz. Wonderful use of lots of snippets and such a darling image as well. Beautiful work Shaz! Francesca hopped into the Playground with this terrific Christmas card to share with us. I love all the little details and such a fun image too! Calling a halt there - my time at the desk is almost up! 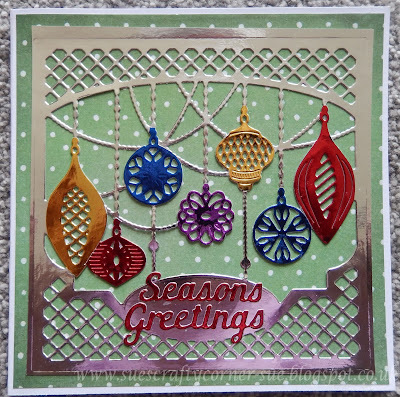 But I just had to share this final pick of the week - made by Karen P. Such a pretty card with loads of snippets used too, The fascinating thing for me is that beautiful soft image and it did take me a while to work out that Karen had wrapped vellum over a coloured image. Clever stuff! Vellum certainly is really popular right now - I see that this week's Less is More challenge theme is to use vellum or acetate. We had no new Playmates last week but 55 of you came to play in total. Yay - what a lovely turnout and so many fabulous makes as well. Yes, it's a die exactly the same as the one I used for the doggie (Tonic Studios 'Scotty Dog', and you can see what I mean about saving the little cutouts. 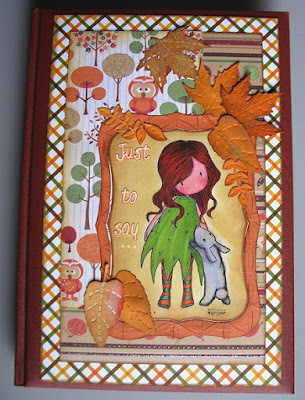 There's also the Inkylicious sentiments stamp set called 'Seasons Greetings'. I've used my own set a few times over the past few weeks on here (as well as today) and as people have already commented, the fonts are really lovely. 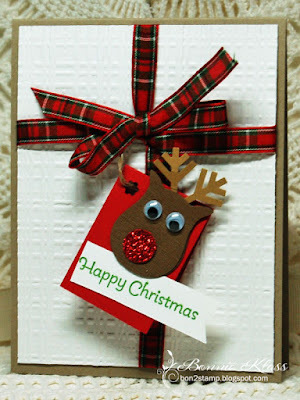 It's time for Rudolph Days on Tuesday over at ScrappyMo's - runs from 25th to the end of the month and an ideal opportunity to make a Christmas card with a sentiment on for Hazel's challenge, anything goes for Mo's challenge - and if you use a snippet then you can link up here as well! And, Penny from sunshinepens rambles has very kindly offered a pair of tickets to the Crafting Live Show at Peterborough, which is on Friday/Saturday 11th/12th November. I think the easiest way to pick a winner of these tickets is also to use Mr Random, although I do realise that Peterborough won't necessarily be easy for some of you to get to :) If you follow the link above you'll see that there are some really well known companies exhibiting their tempting wares! So, if you would like to win these tickets then just say so in a comment please and I'll keep a note and run the random number thingy before next week's post is up and running. I have the tickets electronically so you wouldn't have to wait for them to be posted. The Snippets Challenge will run for one week and the Playground gates will close at 11am UK time on Saturday 29th October. The gates will open again at midnight UK time on the same day. A maximum of ONE entry and please say in a comment if you wish to play and be a possible winner of the prize. I think both items work really well as a pair but if you have a burning desire for just the die or the sentiment stamps then please feel free to say and if your name pops out then I'll do a second draw for the item you don't want.Please also link back to the Playground in your blog post to be eligible for the draw. Hugs from Parsnip - caught him rootling through my makeup drawer the other day, flinging stuff hither and thither. Only looking for green eye makeup .......... so he can plaster his face and whiskers in order to scare the local kids at Halloween when they come knocking! At the risk of being a bit 'samey' - here's a slightly different card to the other one, published on here fairly recently. I found the best way to check for possible images to cut down was just to have a couple of pieces of paper to blank off areas of the image and see if it still works OK. These cards are 'Parsnip Specials' of course, to enclose with Playground prizes! He finally left his beloved 'pickled conkers' alone for long enough to wander into the craft room, hop onto the desk, borrow my specs and have a look. I did resist the urge to lock him in the craft room and rush off to empty the vinegar away - it smells like a pickle factory in here! 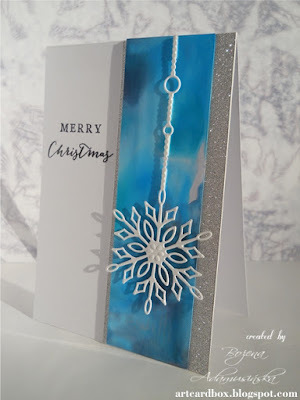 I'm thinking that this technique would be great for Christmas cards too! 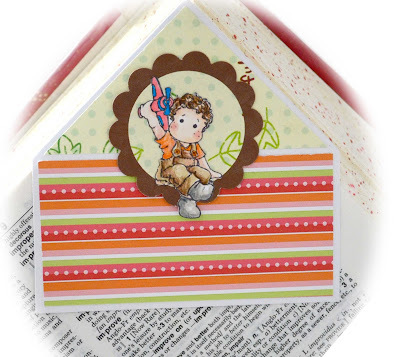 And, yes, I did find out how to use the Misti to stamp those multiple layer stamps accurately and easily. Just need to have a play! Time for another Cuttlebug Mania Challenge and the theme this time is 'Something Spooky'. By that we mean you can let your mind go a bit mad - for example, ghosts, mummies, spiders, witches, kids in costume, or lots of black. Or any other bright ideas so long as it fits in with 'Something Spooky'. 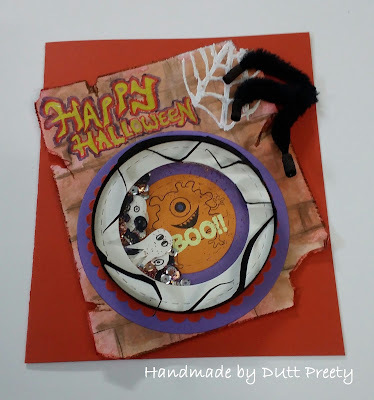 I struggled with my DT card as I have almost zilch items here to do with Halloween - and in fact, I used this same main die last year for a similar theme over at Cuttlebug Mania. Mind you, it's so specific to Halloween that it needs an annual outing! - next, die cut the really fun Cheery Lynn Designs 'Witches Laundry' from black card and glued it in place across the card. The Woodware Ultra Fine applicator bottle is perfect for fine work like this! We'd love to see you over at Cuttlebug Mania and the challenge runs for two weeks. It's been a busy week here in the run up to Len's Birthday. He had a lovely day yesterday, archery in the morning trying out his new bow in the Autumn sunshine. And then we had a very pleasant evening at home, with a meal delivered. We're off out on Monday for lunch and possibly a trip out on Tuesday as well - this is one loooong Birthday celebration :) And Len also says a huge thank you for your lovely Birthday wishes left on here when I published his 'guitar' card. It was a great hit and he couldn't believe it started off as a stamped image! - snippet of white card stock, embossed using a Couture Creations embossing folder called 'Candy Stripe' - bought at Coventry the other week - trimmed down and glued in place. Am not sure the folder was such a bargain as it leaves little cuts here and there right through the card stock - and is such a tight squeeze to get through the Cuttlebug I was worried I'd break the machine! - glued the finished panel to the card front and called it done! This card was also for Len's Birthday yesterday - 'from' the hedgies and garden birds he looks after so diligently! He knew I'd been struggling whilst making 'a card for him' last week and, without knowing anything about the card, made me step away saying 'A hand made card doesn't need to be perfect' - bless. And he loved the card yesterday! (Thinks I'm probably barking mad as well I expect). Lia was first into the Playground with this really fun Minions card - love it! 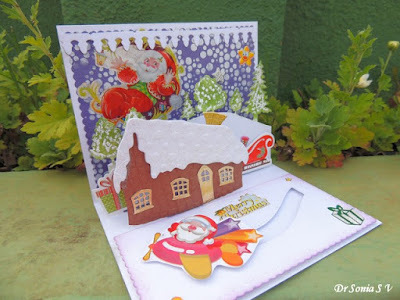 Brenda makes some amazing cards, and this really is a beauty! A perfect Autumn scene I'm sure you'll all agree. 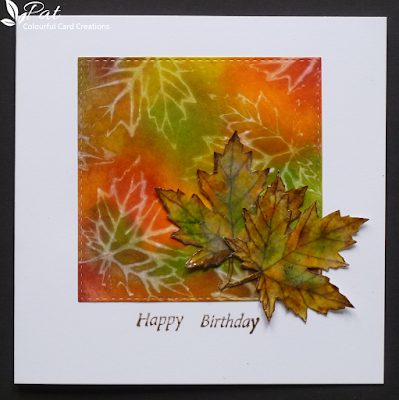 I love, love this beautiful Autumn card, made by Pat. She used the 'ghosting' technique for her background just perfectly - and those leaves are so realistic! I picked this fabulous collage card, made by Jane as it's a perfect illustration of using up lots of little snippets. And it's a jolly good card too! This card, brought to share by Lynn (Linby) is such fun. I have this same set of stamps and sat for ages pondering over why Lynn picked those particular stamps for this super card! The answer? 2 10 6 = 2016 (almost)! Clever sausage! Love this card, made by Helen! 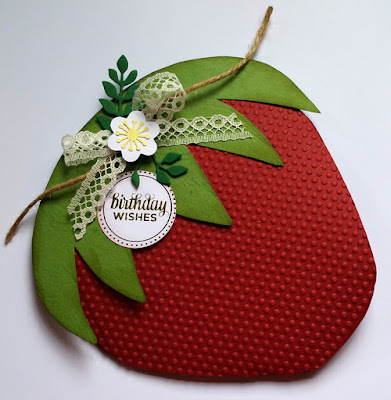 Such a great idea to use a snippet of patterned paper for the curved portion at the top of the card - and it's lovely how the colours tie in with that adorable image :) Another super idea I want to try out. 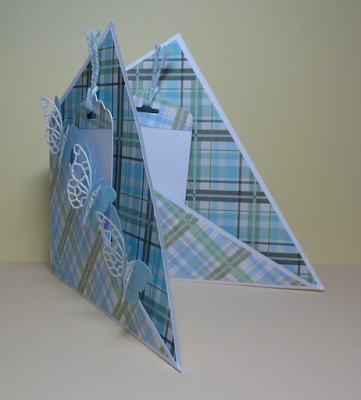 This is such a beautifully designed Sympathy card, made by Janice. I really love how she used a vertical panel of the embossed 'Tied Together' card underneath those really pretty branches and birds. 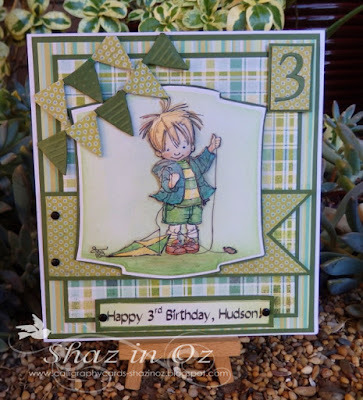 LOVE the design of this adorable card, made by Heather! Heather was desperate to use those darling little dragons (by MFT) and they work beautifully on this fun Christmas card. Calling a halt there - my time at the desk is almost up! I need someone with a whistle like you used to have at boating lakes in the 'olden days'. The attendant in charge of hiring out the boats gave you a shrill blast and hollered something akin to 'Come in number 10, your time is up'! Preety came to play for the first time, bringing this really great Halloween shaker card to share. Such a fun card and I love how in amongst the shaker filling there are teeny little bats, individually punched! Preety has only been blogging since last month and up to now has just two followers, one is me. I know we all started out with zero followers and were so delighted when the numbers crept up. I'd love for you girls to hop over to say 'Hi' to Preety - and perhaps add yourself to her list of followers. Welcome from all of us Preety, please come back and play again soon! And it's prize draw time, for the prizes from last week. Loads of lovely images to play with Lynne - I think you'll have fun with these! I laughed out loud - Mrs A's number popped out first for this prize! Of course I just re-ran the Random number thingy but it did make me smile :) It's a lovely folder Em and am sure you'll enjoy using it. Congratulations to all three of you girlies! Can you please all drop me emails with your addresses in and I'll post your prizes off as soon as possible! My email address is on the right hand side bar. I know that you possibly all have the same snail mail address if you won before, but I need to make sure after a wrong assumption I made a little while back. A Penny Black stamp set the same as I used on my snippets card today - called 'Loads of Love'. The Snippets Challenge will run for one week and the Playground gates will close at 11am UK time on Saturday 22nd October. The gates will open again at midnight UK time on the same day. Hugs from Parsnip - he's busily pickling conkers in vinegar ready for the forthcoming Playground Conker Championships :) Little cheat! Phew - what a saga!